Cardinal Theodore McCarrick Resigns Amid Sexual Abuse Allegations McCarrick was a globe-trotting Washington power broker and one of the Vatican's highest officials. He faces multiple allegations of sexual abuse, misconduct and harassment. Cardinal Theodore McCarrick, shown with Pope Francis, has resigned from the College of Cardinals over sexual abuse allegations. An investigation found evidence he had abused a teenager 47 years ago. A prominent Vatican diplomat and the former archbishop of Washington, D.C., has resigned from the College of Cardinals over sexual abuse allegations. Cardinal Theodore E. McCarrick presented his resignation on Friday evening. In a statement on Saturday, the Vatican said: "Pope Francis accepted his resignation from the cardinalate and has ordered his suspension from the exercise of any public ministry, together with the obligation to remain in a house yet to be indicated to him, for a life of prayer and penance until the accusations made against him are examined in a regular canonical trial." 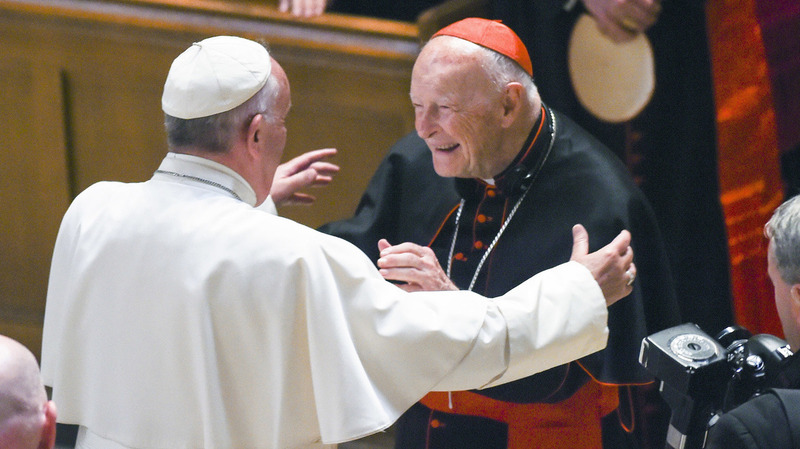 McCarrick, now 88, has been one of the Vatican's most prominent officials. As archbishop of Washington, a post he served in from 2001 to 2006, McCarrick helped form church policies aimed at protecting young people from sexual abuse within the church. His resignation follows an investigation by law enforcement officials and an independent forensic agency that found evidence that McCarrick had sexually abused a teenager 47 years ago while serving as a priest in New York. Some months ago, I was advised by the Archbishop of New York, Cardinal Timothy Dolan, that an allegation of sexual abuse of a teenager from almost fifty-years ago had been made against me. At that time I was a priest of the Archdiocese of New York. While shocked by the report, and while maintaining my innocence, I considered it essential that the charges be reported to the police, thoroughly investigated by an independent agency, and given to the Review Board of the Archdiocese of New York. I fully cooperated in the process. My sadness was deepened when I was informed that the allegations had been determined credible and substantiated. While I have absolutely no recollection of this reported abuse, and believe in my innocence, I am sorry for the pain the person who brought the charges has gone through, as well as for the scandal such charges cause our people. There are also claims of misconduct and harassment against McCarrick involving adults. Earlier this month, a New York Times investigation detailed the story of a man who said he was abused in his early 20s by McCarrick. At the time, McCarrick was serving as a New Jersey bishop in the 1980s. The Times investigation uncovered secretly paid settlements by two New Jersey dioceses in the mid-2000s to two men over allegations against McCarrick. In a blog post, Vatican analyst Rocco Palmo noted that the Vatican's statement on McCarrick's resignation references several allegations against him, "Notably, while McCarrick's de facto suspension from ministry already took place upon the archdiocese of New York's June judgment of his abuse of a 16 year-old boy on two occasions in the early 1970s as being 'credible and substantiated,' today's statement refers to 'allegations' in plural." Father Desmond Rossi, currently a priest in the Diocese of Albany, says he was one of McCarrick's victims. Rossi told NPR'S Weekend Edition he's relieved that the cardinal resigned. "Greatly relieved, because I had tried to get the attention of various people for quite a while and he was a very powerful man in the institution. And as we know of most institutions — not only the church but even in the secular world — wherever there's power, there's an opportunity for the abuse of power." On June 20 in an interview with NPR's Mary Louise Kelly, the Rev. Thomas Reese of the Religion News Service said of McCarrick, "The simple fact that he was not only an archbishop but also a cardinal shows that, I mean, you can't get much higher than that in the Catholic Church. Not only that, he was used by the Vatican on all sorts of diplomatic missions. And he was highly respected not only within the church but also by government officials around the world, including in the United States." "The middle way would be that man cannot exercise ministry, because he's dangerous ... We really have to make sure that we are organizing the most perfect child protection program, so that this will never happen again." According to Palmo, McCarrick's resignation from the College of Cardinals is the first since Father Louis Billot resigned in 1927. McCarrick will now face a canonical trial, which could lead to further sanctions.